God reasons to choose us. Our all inclusive prices for car hire in Malaga are clearly stated on the front page and shown when you introduce your rental dates and time in the price calculator. The price will be confirmed in an email and there will be nothing more to pay. This is what we call tranparency and customer friendly rental conditions. FRIENDLY customer service and help if something against all odds should happen and you should really be in need of help. 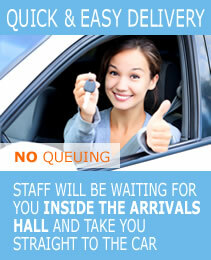 A quick delivery of the rental vehicle at Malaga airport is the key to at good start of your holiday. 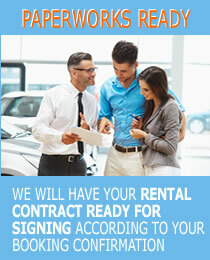 Delivering the car rental Malaga quickly, means that you can be on the road in only minutes after landing. Providing that you have amended all necesary information in advance, the car rental contract will be ready for signing on arrival at malaga airport - this saves both you and us time! 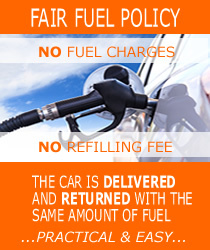 Our swift and easy delivery procedures allows you to be on the road in minutes. We are against the non-transparent car rental policies that many car rental companies in Malaga operate with. We do not make a business out of selling add-ons on arrival, when promising to deliver all inclusive car hire Malaga with no hidden extras. Please be so kind to compare carefully before making the wrong choice on a seemingly cheep ofer that may turn out more expensive than our very generous low prices Car hire Malaga. We suggest you read the information on the front page as well. Cheap car hire malaga airport can turn out to be a both time consuming and irritating experience and with that being a bad start of a holiday, if you book with the "wrong" company. 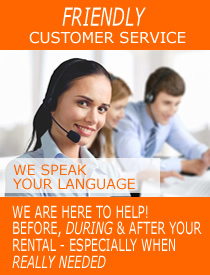 We trust that this page regarding our truly fully comprehensive car rental malaga airport has been helpfull.